There have been many reactions to the watergun fight and subsequent damage at Balboa Park's iconic lily-pond. CityBeat's Justin Hudnall wrote a first-person account of the night and one of the organizers, Matthew Hardick, has come forward with an exclusive interview with News 8. It has been reported that donations from the public have exceeded $9,000 and you can donate to Friends of Balboa Park here. Summary: a handful of idiots ruin an event that, while poorly thought out, was created with good intentions. As reported by The Reader and CityBeat and The Reader again, Kadan is closing down (effective August 22). The neighborhood bar which sits at the corner of 30th and Adams, has been around for about a decade and while both articles focus on the nightlife of the bar, it was also one of the cheapest drinking spots around (with happy hour offering wells as low at $1.50 the last time I was there during daylight). So they're reporting that the adjacent taco shop, the laundromat, the liquor store and the bar will become one large establishment from the owners of Neighborhood. While technically located in North Park, the neighborhood straddles Normal Heights and University Heights and has sometimes been referenced as "Between Heights". The little corner that could has changed numerous times over the years, in fact, my dad loves to tell me how he and his buddies enjoyed 25 cent pitchers on what was known as "The Four Corners" back in the early 70's (though he probably had to walk uphill both ways through the snow to get there). Currently the corner is home to Air Conditioned Bar, Casa Mayahuel, Jayne's Gastropub, and Antique Row Cafe. There are so. many. festivals! It feels like Street Scene is far enough behind us that everyone is ponying up to attempt to create the next big festival. Imagine a world where they'd all get together and share sponsorship! 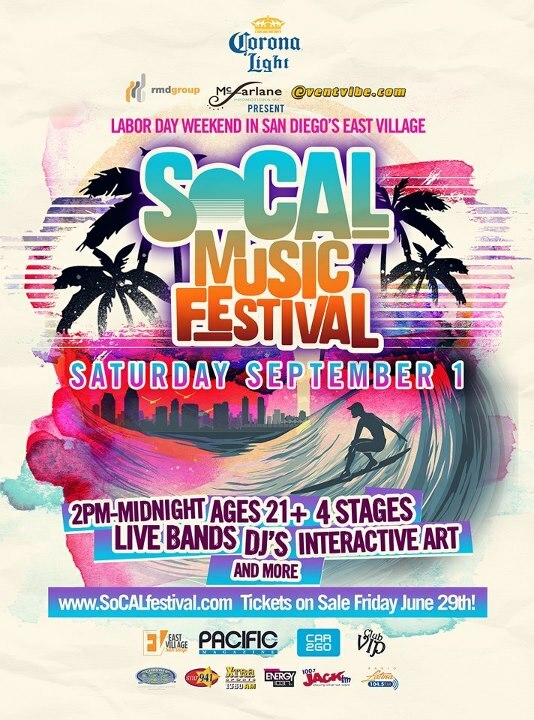 Until that comes, two new festivals are on the horizon: The SoCal Music Fest on September 1 and Night & Day Street Fest on October 13, both in the East Village. The SoCal Music Festival is the cooperative effort of MacFarlane Promotions, RMD Group, and Event Vibe. It will be held between 9th and Park along G St. with four stages and various "SoCal experiences". The lineup includes Cold War Kids, Designer Drugs, Felguk, Krewella, Too Short and more, including locals like Vokab Kompany, Hyena, Family Wagon, and The New Kinetics. Ticket prices increase the closer the show gets, but are currently available for $40. Get info here. 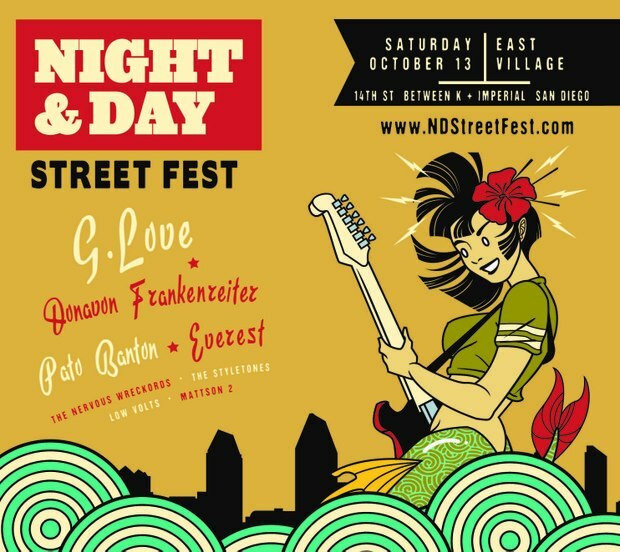 Night & Day Street Fest is being brought to you by UT San Diego on 14th between K and Imperial on October 13th from 4pm-midnight. 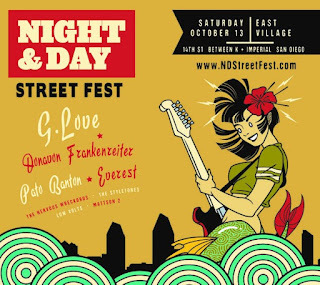 The lineup features Donovan Frankenreiter, G. Love, Pato Banton, and Everest with local support from The Nervous Wreckords, The Styletones, Low Volts, and Mattson 2. Tickets for the event are $25 or $95 for their VIP package. Get more info here. Keep in mind, these are in addition to the other great things we already have in San Diego, like the San Diego Music Thing (September 14-15, $30-$55), Adams Avenue Street Fair (September 29-30, Free), and I presume Rocktoberfest will return to North Park in late October. Speaking of festivals, some bummer news about FM 94/9's Indie Jam...the Casbah stage has been canceled. The lineup for the show has been updated on FM 94/9's page to feature Fiona Apple, Best Coast, Oberhofer, and Gardens & Villa. Ticket prices have not changed, which probably just means you'll get longer sets from the four bands on the main stage. If your were set on seeing Father John Misty and Pinback, they can still be seen at the San Diego Music Thing. (Read about new music from Pinback courtesy of CityBeat's Check 1, Check 2 blog.) FM 94/9 is offering "safe rides" to and from the Oceanside Pier For just $15 from North Park (True North Tavern), Downtown(Barleymash) or Pacific Beach (Open Bar). Get tickets for the concert and the bus here. Perhaps you were already aware that Wayne Coyne of the Flaming Lips has been working with legendary director Des MacAnuff to create Yoshimi Battles The Pink Robots. The musical will make its World Debut at the La Jolla Playhouse in November, and this week, NME featured a preview about the show. Tickets haven't gone on sale just yet, but keep your eyes and ears open for what promises to be an interesting musical adventure. One Week Until FYF Fest! !